Comments have already poured in regarding hyperinflation. A new report on Japan the Tipping Point will deal with the worse fiat monetary system in history. That should be ready shortly. Everything follows a bell curve. Some regulation is necessary to establish rules of conduct to provide the reason to come together to form society. But if you keep going, there is a point when over-regulation just chases people out of the system. Taxes are no different. Both Rome and Japan kept raising taxes to the point people lost property when they could not pay the taxes and simply left. This is the danger of property taxes. If you work your whole life, you cannot just stop paying taxes. The state continues to raise property taxes even when you have no income. Follow that bell curve and people lose their property. Property taxes are the MOST draconian of all. Core economies ALWAYS turn against the people. They ASSUME that they will be ok if they can just get all the revenue they think really exists. This is WHY there will be no HYPERINFLATION because the state always commits suicide. The more they cut services and raise taxes, the worse the economy becomes and you go down the rabbit hole and do not come back. When Rome fell in 476AD in this manner it took effectively 600 years to come out of the Dark Ages. Money disappeared. 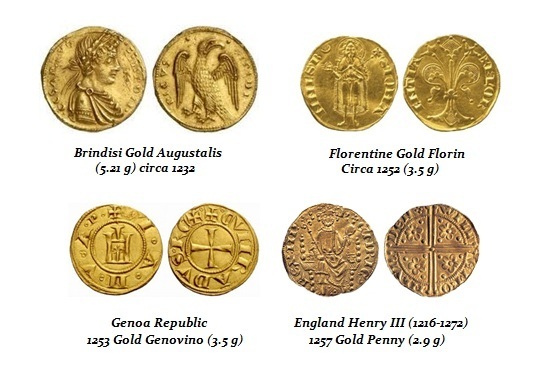 There were NO gold coins minted at all until the 13th century. It was Charlemagne who reintroduced the silver denier modeled after the Roman Denarius, There was little coinage in Europe prior to that and there was NO standard whatsoever. City States all had different monetary systems. The foreign exchange business was good back then and that is why banking reappeared from merchants. From a timing perspective, Japan followed the same pattern There were no coins produced at all between 987 and 1587 for 600 years. So it is possible for society to completely collapse if government doesn’t stop this insanity. Marxism has been proven WRONG! It even violates the Ten Commandments. The danger is NOT by any means HYPERINFLATION. It is that government forces capital to hoard, withdraw from commerce, and then the downside of the Bell Curve becomes inevitable. That by no means suggests you should not have gold. Of course! What it means is pay attention because gold will be the key to the underground economy but government knows that as well. So I do not like that they are now tracking the movement of gold. Where to store it, well certainly not in an official bank facility. They took all the gold in banks in 1933 back then as well. We will deal with these issues at the upcoming Sovereign Debt Crisis Conference in Philadelphia on March 16th. This will be no walk in the park.